While we wait for BREC to polish off the last of their plans before they’re ready for a grand opening celebration at the new paddle launch, we’ve been staying hard at work out on the bayou. Lately, it seems that every time that Bayou Fountain has started getting low enough to reach some of the “problem” areas we wanted to clean up, inevitably more rain has come along and put things back out of reach. Certainly, we don’t mind at all having plenty of water around to make the paddling easy and mostly bump-free, but we did want to take care of a few things we knew were lurking below the surface. On Saturday, we finally got the chance. The water was low enough that you could easily see the last of the 13 steps of the launch as it sat just below the surface. 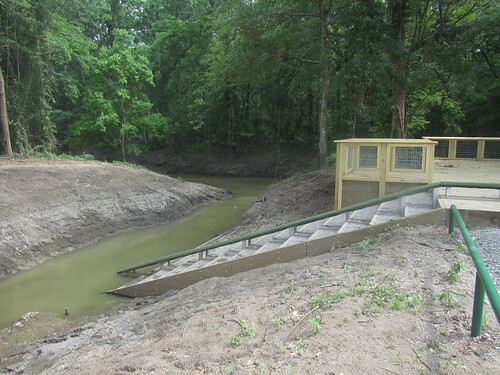 (Stepping off the last step, it was almost hip deep in places — fine if you’re in waders, but less desirable if you’re in shorts and a tennis shoes.) 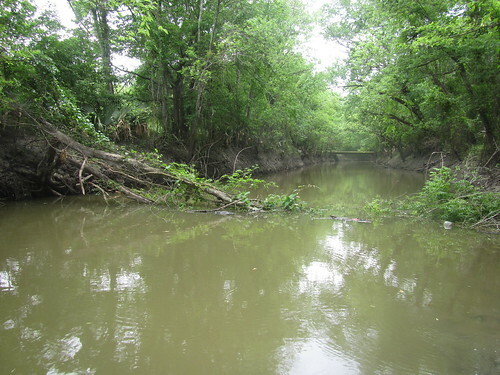 Even with the low water, it was wonderfully easy hitting the bayou and heading downstream. Then, just before Rackley Bridge, a vine-covered tree had fallen. Usually, trees fall in the bayou when the roots give way, but this one just snapped off (both trunks). Still, as far as fallen trees go, dealing with this one was downright easy. With the bayou low enough to wade out and work standing up, it took practically no time to cut through all the vines and dismantle the branches. Less than 20 minutes of work, and it was on down the bayou. With no other trees down, we made Bayou Manchac by about 10am. After paddling over to the Alligator Bayou end of Manchac to check things out there, it was time to turn back toward the park. There were plenty of spots to do quick improvements by pulling submerged limbs and logs, but all the work was relatively easy and optional. Even pausing for all the pick-up jobs, we made it back to the park way too early to call it a day. With some “free time”, we finally tackled all the submerged wood behind the old archery range (some of which is in the photo above), and the couch seems to have disappeared/disintegrated. There shouldn’t be any need for the low-water slalom there anymore. It was still a bit too early to call it a day, so we channeled Columbo (“one more thing”) and added a quick trip up to Siegen/Burbank. Someone had mentioned a tree down, and just upstream of the park, we found it. 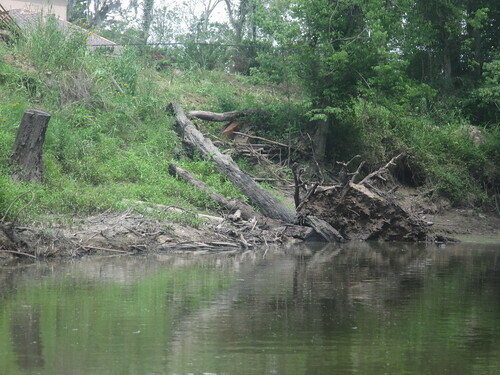 A large long-dead tree had fallen across the bayou (which was still passable, but definitely impaired). While I was pondering how to deal with it, the gentleman working with heavy equipment (an excavator?) way up on the bank called down and offered to help. He tossed a chain down, I rigged the trunk, and as easy as that, the tree was pulled out of the way and up the bank. We normally do everything with hand tools and muscle power, but having mechanized help was a godsend on that one. Thank you again; you made my day! After a quick minute or few of work to open a way through the debris at the Siegen/Burbank bridge, it finally felt like it was high time to wrap up the day. 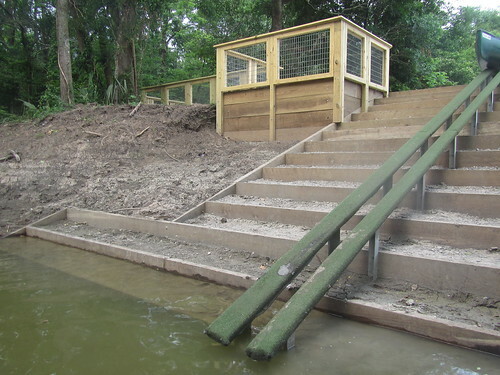 We managed to cross quite a few things of the maintenance wish list thanks to the low water, and everything should be good to go for a grand opening once BREC has all their waterfowl properly queued. 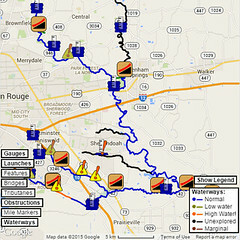 At the moment, there is quite a bit of litter distributed along the bayou, especially in the bottom two miles. If anyone wants to come along and help pick some, we’ve got plenty to go around. 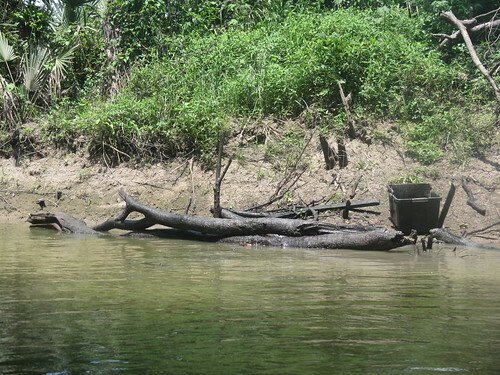 (We can even tow an extra canoe or Canoemaran for you to pitch your full bags into, if it’d be convenient.) Either way, we should be back out there Saturday morning for another paddle trail maintenance/cleanup trip, so we might just see you out there.